There are people who influence our journey as writers. For some of us, those people are family, and for others, they are friends. When I started out on my journey as a blogger, and poet, there were friends who I had never met and they influenced my journey in so many ways. I met a few of them, Nimue included, and I am happy for that. One person who I haven’t had the pleasure of meeting yet is Amias, who I still call as my teacher and guide for a form of poetry – the acrostic. This book is hers, and it was sent by her from the United States, long back. As I try to rediscover my love for that poetic form, I thought I shall start with sharing my thoughts on her poems and reviewing this book. It is difficult to do poetry when restricted by form. Some find the first aspect of the form and write on that, thinking that that’s all there is to it, only to discover more in it later on. That’s how my acrostic discovery has been. 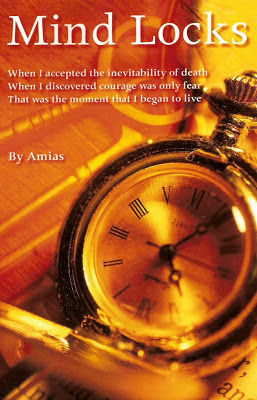 Amias shares with us her life in poetry. It has beauty in depth, and sometimes a little difficult to understand immediately. It takes time to set in. Sometimes, few lines of a poem just get to you, and you see yourself. Yes, I relate to this at times. Sometimes I just want to take a breath and stop going a million miles an hour. The pain of missing out some precious things later becomes unbearable, and makes me tired of life itself. I guess a lot of writers might be able to relate to that relaxing night time when we aren’t disturbed while writing. There are gems like this throughout the book, and you’ll find yourself going “wow”. There are others that are true to her, but not something we might understand. I like this book for those gems. I also am thankful for her words at the start that she writes to me. She’s been away from the blog world for a while now, but if she chances upon this somehow, I hope that she shall return to blog world and her meme which misses her touch, something that I have not been able to replicate though she handed it to me to manage.